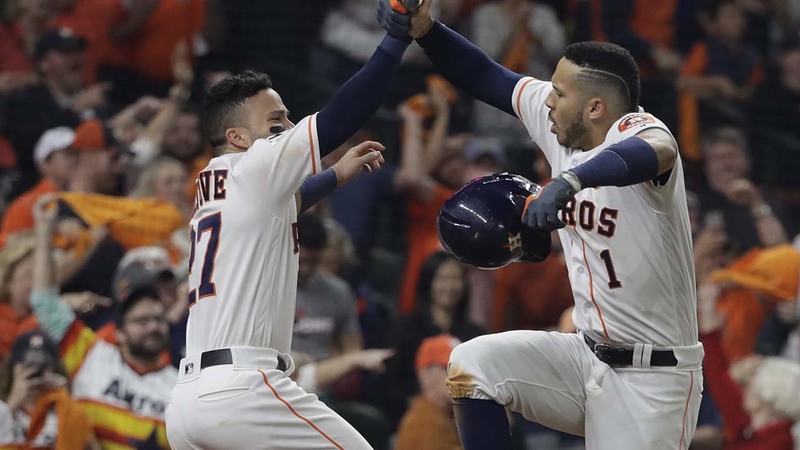 HOUSTON -- When the winning run finally came sliding across home plate on Alex Bregman's single, more than five unforgettable hours after the first pitch, a frantic Carlos Correa sprinted toward his Houston Astros teammates in the middle of the diamond. "I feel like I'm going to have a heart attack out there," Correa said. "The best game ever, for sure," Correa said. Wacky and whacky with seven home runs, this perhaps topped Toronto's 15-14 win over the Phillies in 1993 as the craziest World Series showdown ever. "Yeah, five-hour game, but it doesn't matter. I can play a 10-hour game if we are going to win," Altuve said. Now, with both bullpens worn down, the teams get a day to recover. Game 6 will be Tuesday night at Dodger Stadium, where Justin Verlander will try to clinch the Astros' first championship and Rich Hill hopes to save Los Angeles' season. "It's hard to put into words all the twists and turns in that game," Astros manager A.J. Hinch said. "These are just two really good teams, just throwing haymakers at each other trying to outlast each other," he said. Silent when ace Dallas Keuchel got crushed, the orange-clad fans erupted over and over as the Astros sent balls careening all around - and out of - the park. "I think this whole series has been an emotional roller coaster," Dodgers manager Dave Roberts said. "It's the two best teams playing for a championship. And these are two teams that play 27 outs." Bregman, who homered off Jansen in Saturday night's loss, lined the next pitch over shortstop to score pinch-runner Derek Fisher, who slid home ahead of the throw from left fielder Andre Ethier. "We're up 3-2, baby," Bregman said. Bellinger hit a three-run drive in the fifth that made it 7-4 and seemed to swing things back in the Dodgers' favor. By the end of the mayhem on the mound, it was a mere afterthought. "Man, I'm mentally exhausted right now," Bellinger said. No wonder there's a bright sign high above the center field wall for a popular taco place in town - it says Torchys and fit perfectly for a game where pitchers got lit up. Yanked in the fifth, Kershaw trudged off with a dubious distinction - he has allowed a postseason-record eight home runs this year. "Just exactly what you expect (when you) come to the park with Keuchel and Kershaw pitching," Hinch said. "At that point, I talked to him before getting the at-bat: 'This is your moment,'" Correa said. "And he didn't let me down. He hit a homer and got us going."